While driving along Roxboro Road on my way to ShopBot Tools World Headquarters (as founder Ted Hall likes to call it) one morning, I spied a sign for the Wright School that I had carved on the ShopBot tool I have in my barn. It made me think about a few of the projects that have been touched by a ShopBot tool in ShopBot’s hometown of Durham, North Carolina. I once heard someone at a ShopBot event say that, “when you get a ShopBot CNC machine, you automatically become a sign maker.” My first “paid” gig was just that… a sign. It taught me that a professional sign maker needs many more skills than being able to carve the design, but the ShopBot goes a long way towards making each sign special. Almost 18 years later, I smile every time I drive past the house in town that sports a white sign with black lettering. The sign itself is the same shape as the house, which makes it a more customized piece than just a rectangle with an address. Look closely in the lower right corner to see my first “gig” with a ShopBot, a sign in the shape of the house. 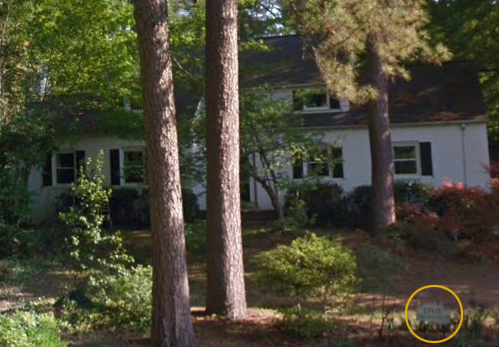 It’s not a clear picture because I want to protect the privacy of the homeowners. This first sign taught me that the design process and finish work can take far longer than carving the sign! Some of my projects are pro bono to contribute to the community. 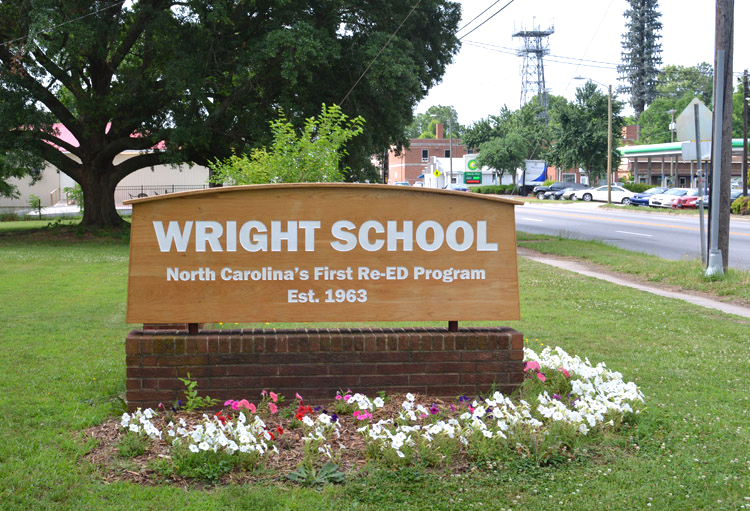 The Wright School in Durham provides best practice, cost-effective, residential mental health treatment to North Carolina’s children, ages six to twelve, with serious emotional and behavioral disorders. 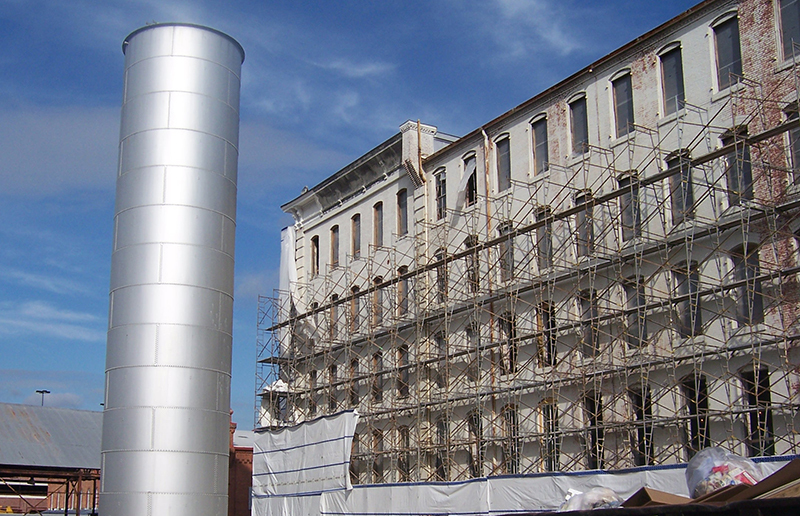 State-supported, it is frequently one of the programs threatened by budget cuts. A friend of the principal wanted to give him a sign for the school as a “thank you” for all of his hard work. The ShopBot did the carving, the friend did the finishing work. 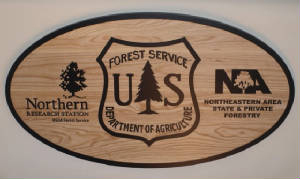 While the sign I did for the US Forest Service didn’t stay in Durham, it was carved on the ShopBot in my barn. The design called for raised lettering, which allowed me to paint the blank with three coats of sign-maker’s black paint, then carve away the low spots. The Hardwood Store of North Carolina in Graham supplied samples to test types of wood to determine what would machine nicely. Ash was the wood of choice, both for color and edge quality. I used a V-bit to bevel the edges of the design, followed by an end mill bit to carve away the rest. Mitch Fisher, of Fisher Signs, sprayed the final sign with three coats of polyurethane before it was sent to the Forest Service in West Virginia. Carving a blank that has been painted first. Finished sign (55” x 33”) after coating with three layers of polyurethane by professional sign maker, Mitch Fisher. 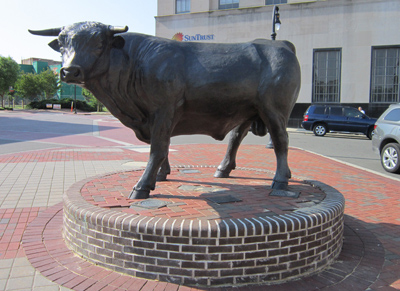 If you drive through downtown Durham (perhaps in search of ice cream at The Parlour), you’ll see Major the Bull striking an imposing figure in the CCB Plaza at the corner of Corcoran and Parrish Streets. The original Major was not created with the help of a ShopBot. 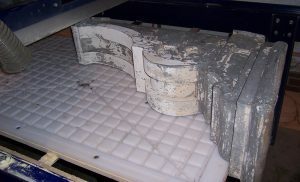 But TJ Christiansen, who is known for his excellent ShopBot trainings in house and online, used his ShopBot to create a foam mold, then welded metal components together over it to create a new version of Major. When last I visited the Durham Performing Arts Center (DPAC), TJ’s version was gracing the lobby. Major the Bull marks the entrance to Parrish Street, also known as “Black Wall Street.” Before the current renovation and revitalization project began in downtown Durham, along Parrish Street and its environs were six monuments that celebrate the contributions of four key institutions that spurred black enterprise in downtown Durham. 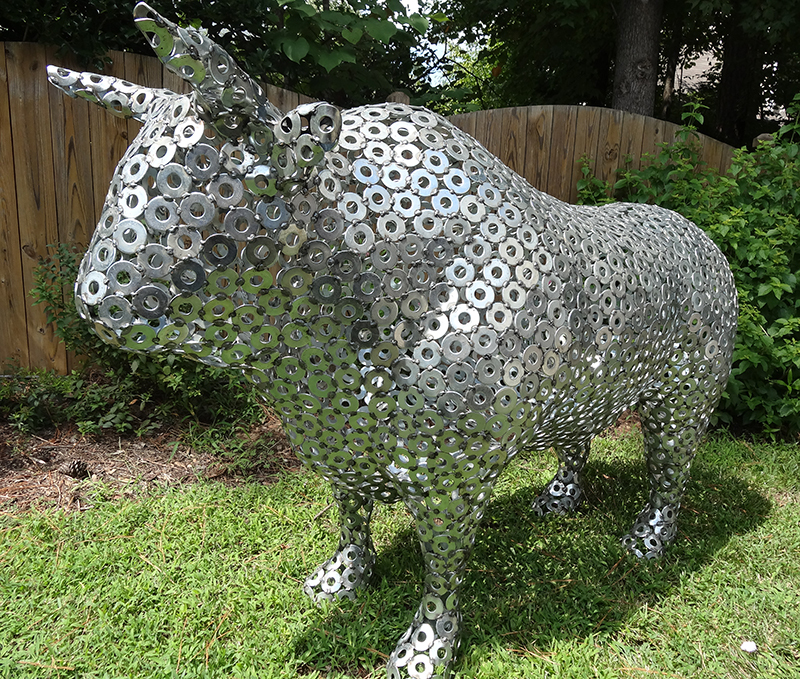 The same artists who designed and fabricated Major, Leah Foushee Waller and Michael Waller, created the six bronze sculptures. The lettering on the aluminum plaques for each of the sculptures was engraved on my ShopBot PRT, using a 90 degree V-Bit, VCarve Pro (then called Part Wizard), and lots of Dawn dish detergent diluted with water (one part Dawn, two parts water) as a coolant. The four institutions celebrated by the monuments were NC Mutual Life Insurance Company, Mechanics and Farmers Bank, The Mutual Building and Loan Association, and North Carolina College. North Carolina College, which became North Carolina Central University, was the first public liberal arts university to support black students. 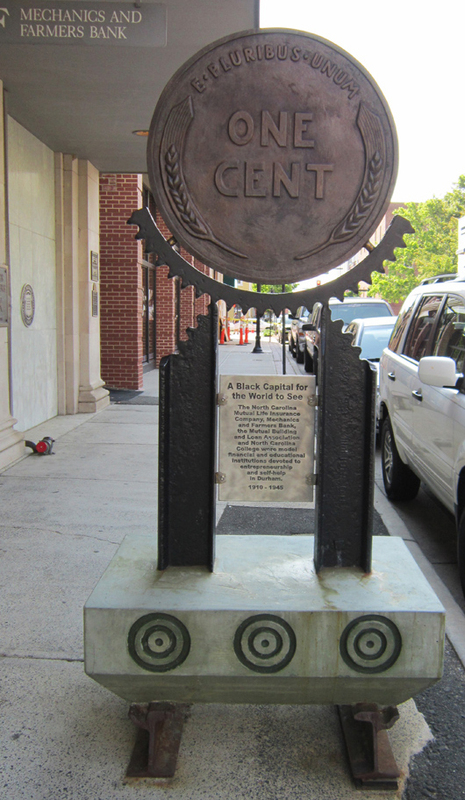 For its centennial celebration, NCCU again called on Leah Foushee Waller and Michael Waller to create a centennial crest for a new park on Fayetteville Street. 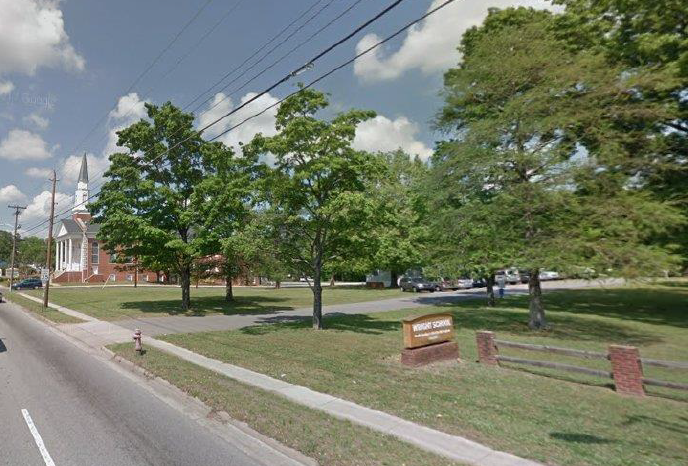 Google street view of the NCCU Centennial Park on Fayetteville Street. The centennial crest is at the top of the stairs. Information plaques for the centennial chapel were also carved with a ShopBot. When creating a bronze sculpture, often the first step is to create a model that is then used to create a mold into which the hot metal is poured. From the letterhead of NCCU depicting a sculpture of James E. Shepard, founder of NCCU, I created the model of the 36” diameter centennial crest out of MDF. 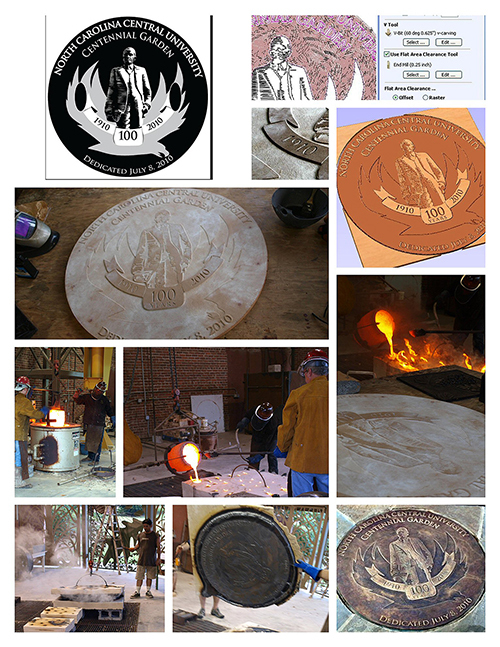 A summary of the steps, from 2D graphic to 3D model, to pouring the molten bronze, and the final product after cleaning up and coloring by Mike Waller, is shown below. The bronze was cast at the foundry of Liberty Arts located in Durham Central Park, where the Farmer’s Market is held each week. It’s worth a visit to see the metal gates of the foundry. Duke University has its own makerspace and technology hub on campus, with a ShopBot Desktop CNC nestled in among the 3D printers. Duke University was also host (and ShopBot Tools a sponsor) for the first Construct3D Conference. Construct3D 2018, the national academic 3D printing and digital fabrication conference and expo, will take place at Georgia Tech, October 5-8, 2018. The second annual event, co-founded by Ultimaker’s Lizabeth Arum and Matt Griffin, and Duke University’s Chip Bobbert, and sponsored by founding sponsors Ultimaker and Duke University, will focus on academic use, best practices, and professional development opportunities for faculty, staff, and students from informal, K-12, and higher education contexts. 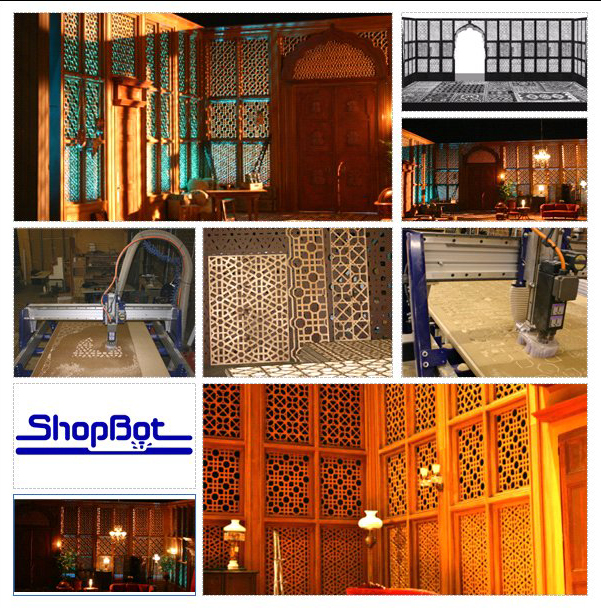 Look for ShopBot to again be a sponsor. While the theatre department at Duke does not have a ShopBot, it has contracted to have a ShopBot create sets for plays that are being previewed at Duke before heading to Broadway and elsewhere. The set for the production of “The Great Game” was machined at ShopBot Tools by the prototype PRSalpha tool with a vacuum hold down table. Hey Duke Theatre Department: Playmakers at UNC-Chapel Hill and NC State’s University Theatre have ShopBots in their set design programs! Set for “The Great Game.” Ninety panels with 250 – 350 plunges per panel were machined in two weeks (8 hours a day) on the first PRSalpha with a vacuum hold down table. So much material was machined away from the board that supplemental hold down (screws) was used in addition to the vacuum. Half inch material, .25” compression bit, ramp into a single pass. Toolpaths included “profile to the inside” for bigger spaces, and pocketing to turn the waste into dust for smaller spaces. NCCU is also home to the first official Fab Lab at a historically black college/university (HBCU). Funded in part by the AJ Fletcher Foundation, the lab houses a ShopBot Desktop in addition to 3D printers, a digital embroidery sewing machine, and an Epilog laser. 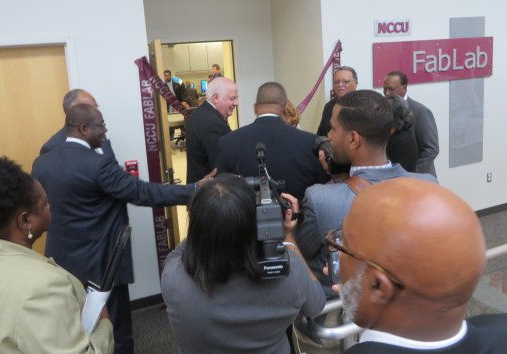 Grand opening of the NCCU FabLab. Signage created with a ShopBot PRT. Funding for the Fab Lab came in part from the AJ Fletcher Foundation. During an official visit by representatives of the Foundation, an NCCU student demonstrates the ShopBot Desktop in the lab. ShopBots also abound in the area high schools. For example, Southern School of Energy and Sustainability has a furniture making program, with the goals of having the sale of the furniture made by the students go towards scholarships for college. Riverside High School has an active PLTW (Project Lead the Way). Jordan High School has a ShopBot Desktop in their woodworking area. When you drive onto the campus of Carolina Friends School, you will be greeted by signs that were created on the ShopBot in the woodshop. 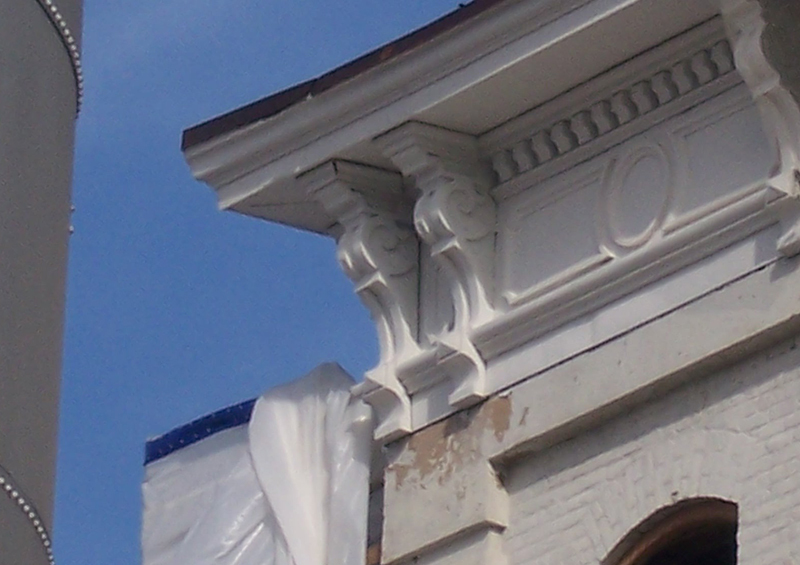 Durham has seen an explosion of restoration and renovation in the last 5–10 years. What was once a sleepy mill town (tobacco and fabric, both now gone) with a university close by has become a destination for the arts, foodies, and young people. Many of the older buildings are being updated, and Chris Burns has been instrumental in helping that happen. 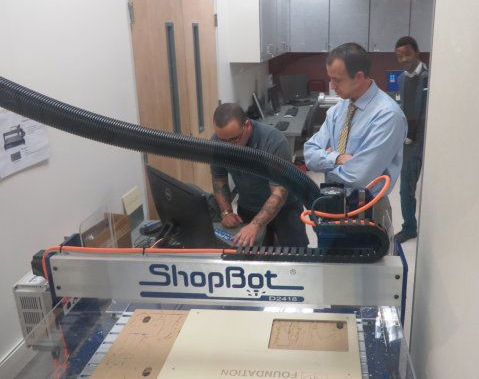 Chris was an original member of ShopBot Tools when it was incorporated in 1996, and still travels for ShopBot to do trainings and installations. He and his family have a service, Austin Automation, in which they contract CNC work. Next to Duke University’s East Campus, Trinity Park is a neighborhood of gracious homes, many dating back to the 1910s and 1920s. One such home was the original Watts Hospital that was moved to its present location on Watts Street when a new hospital was built. After being allowed to fall into disrepair (a bathtub from the second floor fell through to the first floor), the current owners did a major renovation a number of years ago, which helped to spur a revival of the entire neighborhood. 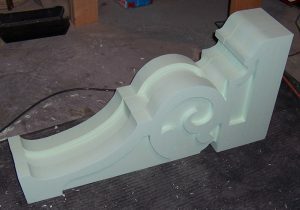 The house was in need of a few tweaks, so Chris did a digital probe of a corbel that needed to be reproduced. 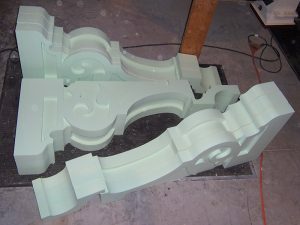 Once he had the digital file, multiples of the corbels could be manufactured. 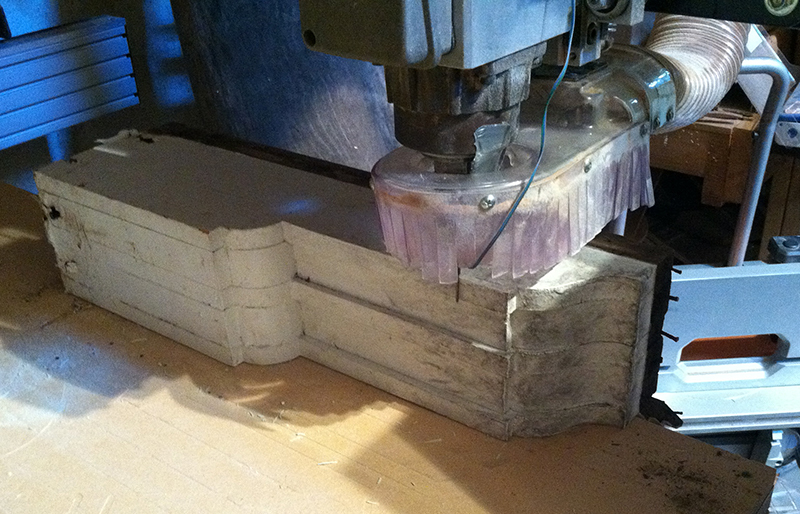 Probing the original corbel with the ShopBot Digitizing Probe. 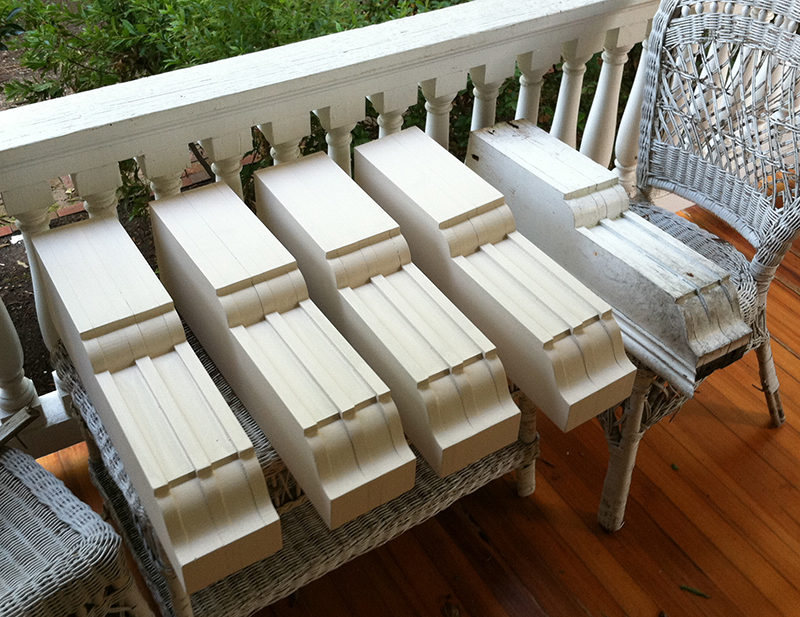 Four new corbels (and the original) on the front porch of the home in Trinity Park, Durham, NC. Chris has also worked on bigger projects in Durham. Sometimes it is difficult to realize the scale of the projects when looking at photos of individual components. For example, here are three photos, the first is the original piece, the next two, the reproductions that Chris created. 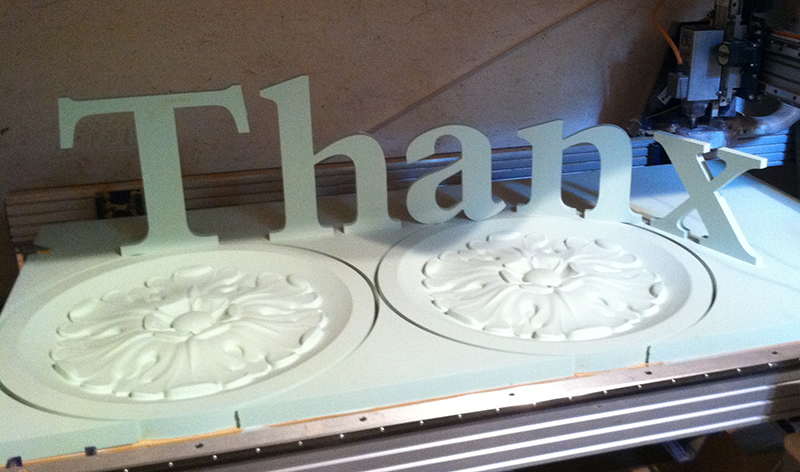 Another Project: Rosettes for The John O’Daniel Exchange are laid out on a 4’x8’ ShopBot. 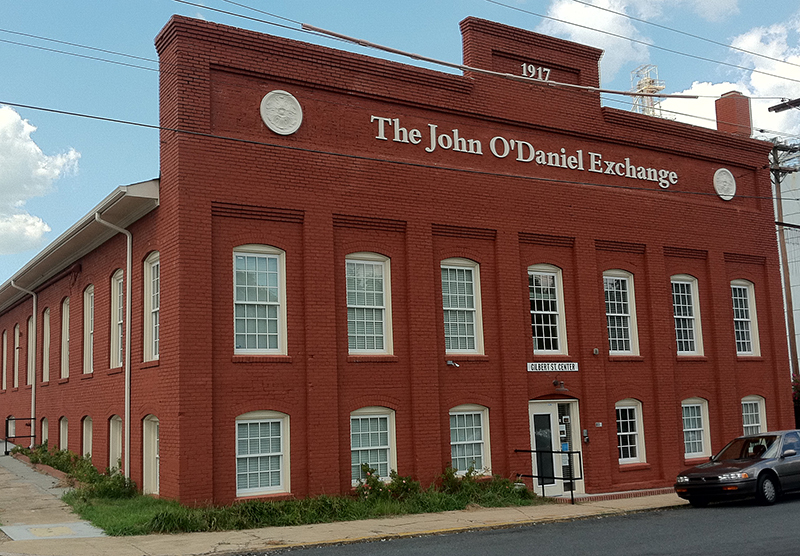 In downtown Durham, next to the railroad tracks on Duke Street, and near several of the renovated buildings, is the showroom and factory of the Durham Bookcase Shop. Owner Philip Fletcher and his crew rely on their ShopBot CNC to create everything from the sign outside the building to the ready-to-finish furniture inside. 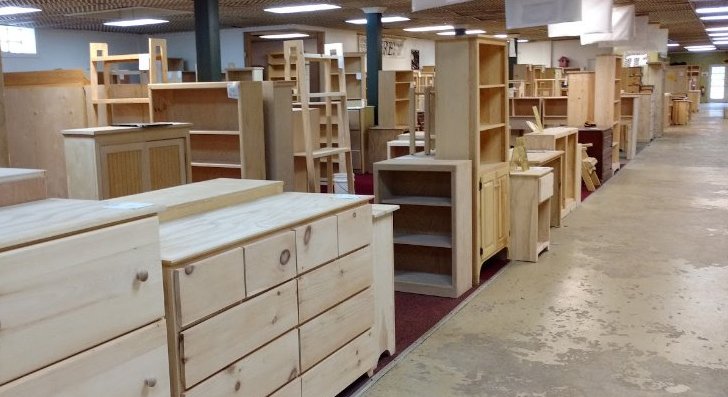 You can purchase something off the floor or specify a custom size bookcase/table/dresser to fit your space. Philip can change the digital file and quickly produce a “one-off” piece. A selection of the possibilities. 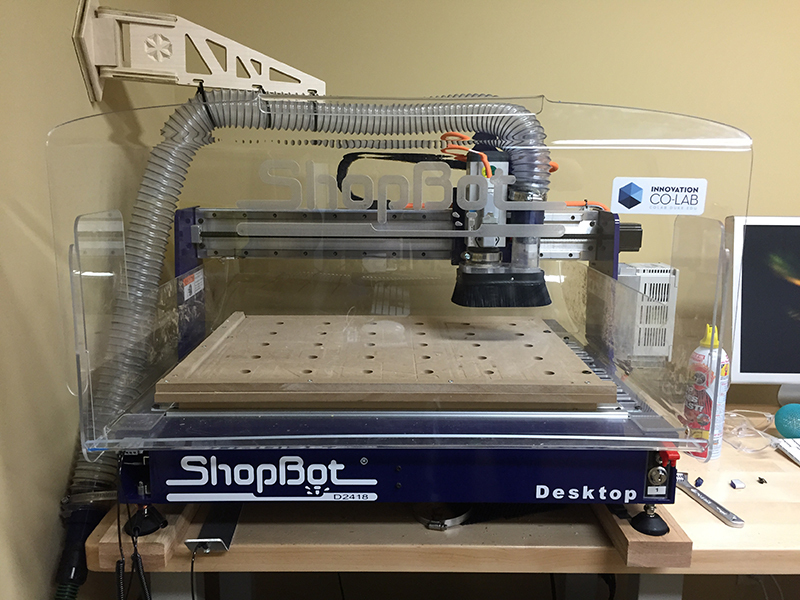 The ShopBot CNC allows the Bookcase Shop to compete with the big box stores and keeps the production local. For over 10 years, Hardwood Designs in Hillsborough, NC used a ShopBot CNC to fabricate high-end interiors at local institutions like Duke’s Fuqua School of Business and the Thomas Center. 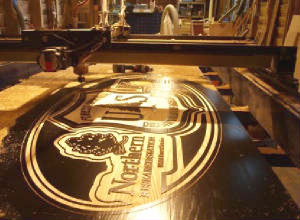 The CNC machine is an important part of their production facility. 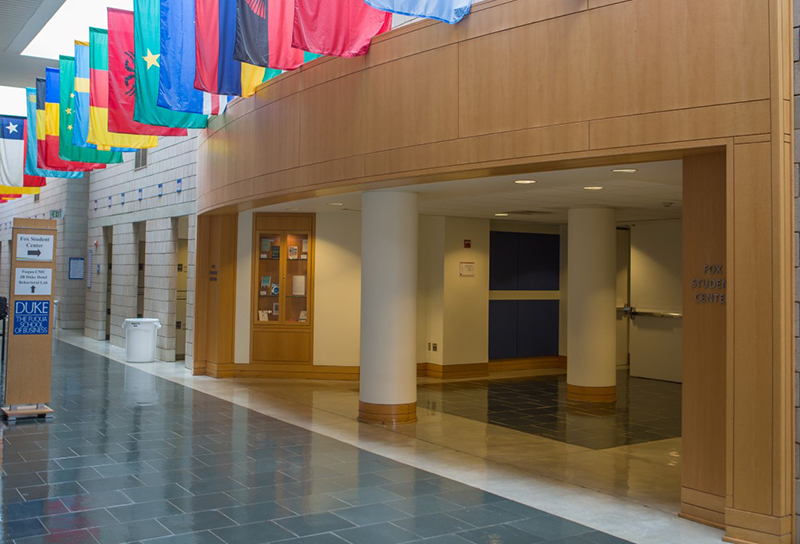 Interior of Fuqua School of Business at Duke University. As mentioned earlier, Durham has become a destination for foodies. There are several key players in the scene: people who have converted what were unhappy places into exciting and inviting places to visit. Nick Hawthorne-Johnson and Rochelle Johnson are two such people. Starting with what was once the Durham Food Co-op building, they created a community kitchen and incubator space that incorporate parts of Durham history. 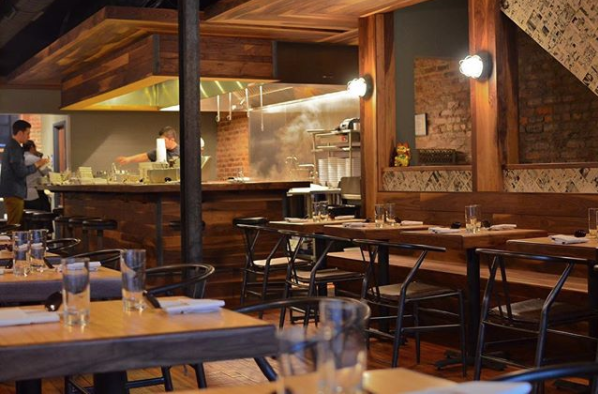 The space has grown into a key event space in town, The Cookery. Visit their website for a 5+ minute video of their early adventures. I have a special place in my heart for Nick and Rochelle, since our son did an internship with them after college. His experience there helped to inspire him to go to law school with an interest in business law. So when Nick and Rochelle started on their next adventure in downtown Durham, I was happy to lend a few hours of machine time for a project that plays a supporting role. If you visit the izakaya (Japanese pub) upstairs above Dashi, a Japanese ramen shop, and you sit in a booth, know that the ShopBot in the barn created the frame for the seats.